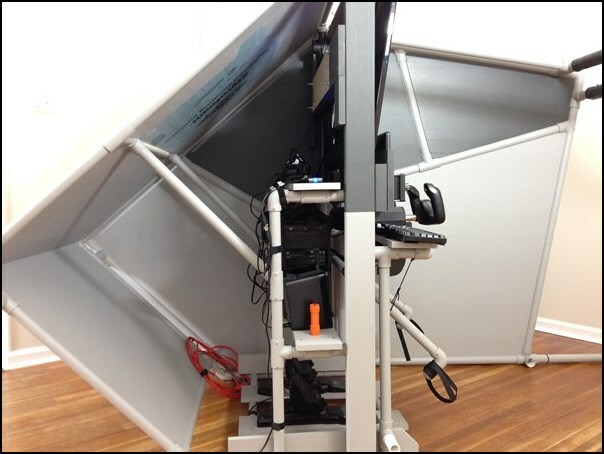 The DIY Flight Sim Pod is a fully enclosed flight sim cockpit and your view is completely filled with the simulated environment. Therefore, you don’t see the other things in the room like furniture, book shelf, plants, etc. You fly in a totally immersive environment. In addition, when you strap into the Pod to start a flight, it really feels like you’re preparing to go somewhere. 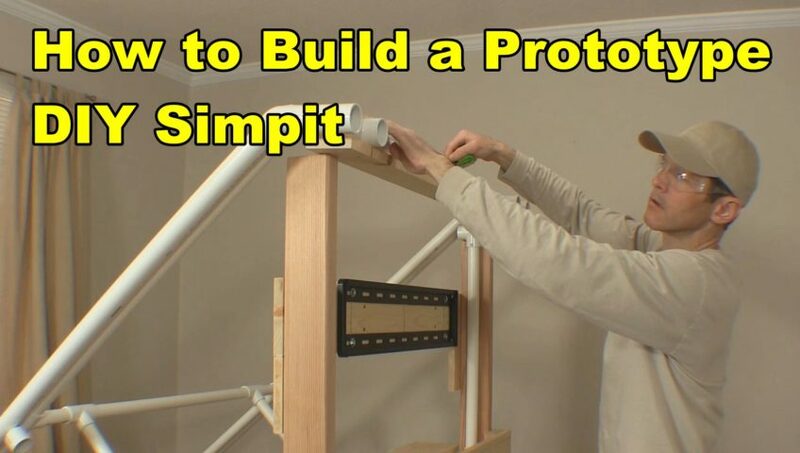 It’s relatively easy to disassemble the Flight Sim Pod because it’s a modular structure. 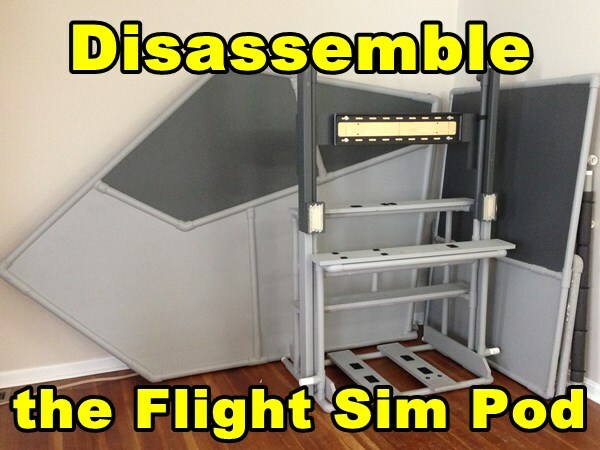 This is how to disassemble this enclosed flight sim. The entire project includes three major assemblies, three subassemblies, flight simulator hardware (including computer), and displays. Start by removing the Tail, Top Canopy with Bumper and Tail. 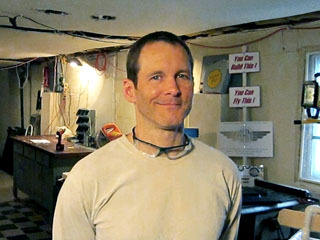 The Bumper is simply the single padded PVC pipe that attaches the Left and Right Fuselage Sides just below the Top Canopy. 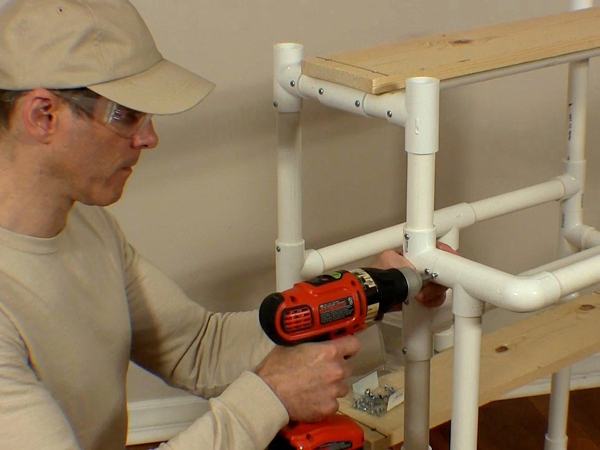 Unscrew the self-drilling screws as needed to free the PVC fittings. Next, remove the Left and Right Fuselage Sides. This leaves the Inner Frame still packed with computer hardware and displays. Again, unscrew all self-drilling screws necessary to free the applicable fittings. 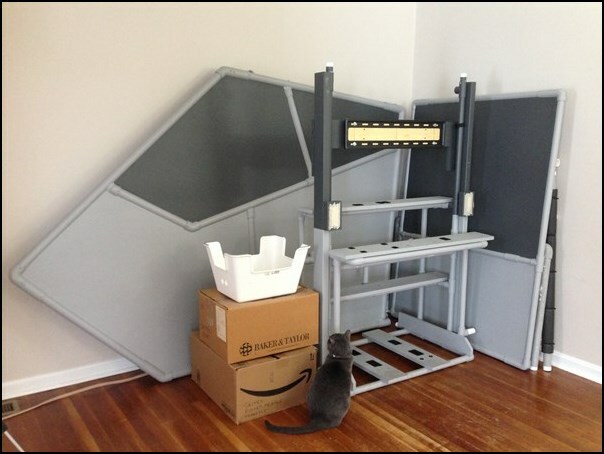 Carefully remove the 40” HDTV main display, cushion it, and place in moving box. Do the same with the instrument panel display. Finally, remove and box all computer hardware and flight controls. 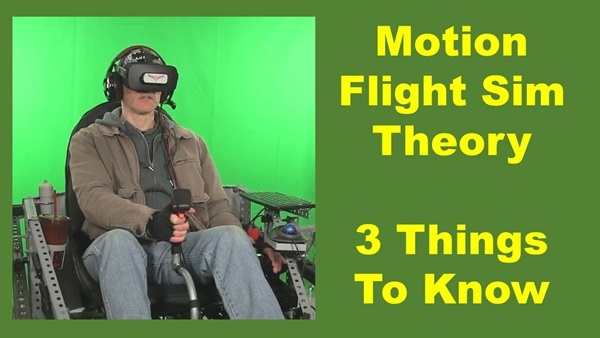 The Inner Frame consists of lumber and PVC pipe and is consequently the strong center structure of the enclosed flight sim. 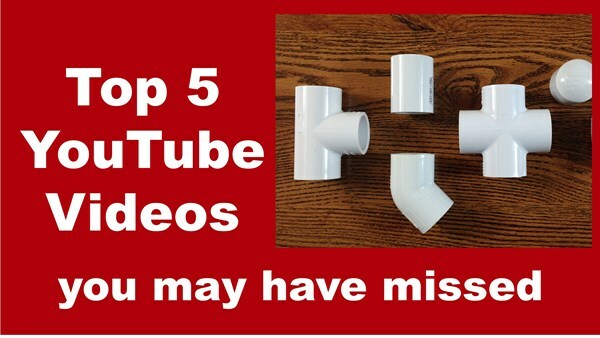 The Nose Cone is the pipe and foam structure that attaches to the front of the Inner Frame. The top and bottom of the Nose Cone is glued together. However, you can separate the bottom Nose Cone panel by cutting just under the point of the Nose Cone. Cut from across the top edge of the bottom Nose Cone panel and also the top corners around the fittings. This will separate the top and bottom of the Nose Cone leaving only the fittings to hold them together. Remove self-drilling screws as required. If you load the Pod into a moving van, note how many of the parts can lay flat. Even the Inner Frame doesn’t take up much room because it’s like a shelf – you can load boxes onto it. Your flight sim controls will all fit into boxes as shown in the picture. 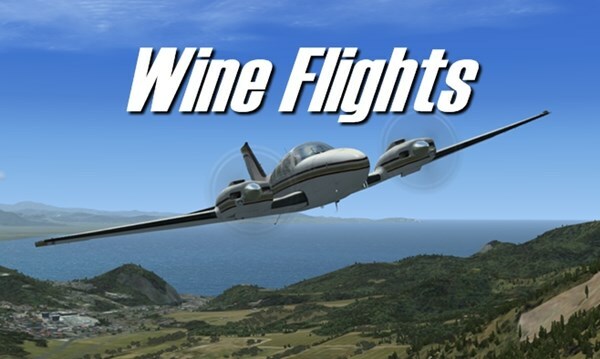 Wine Flights is the nick name we gave to a couple of flight simulator parties we had a while back. 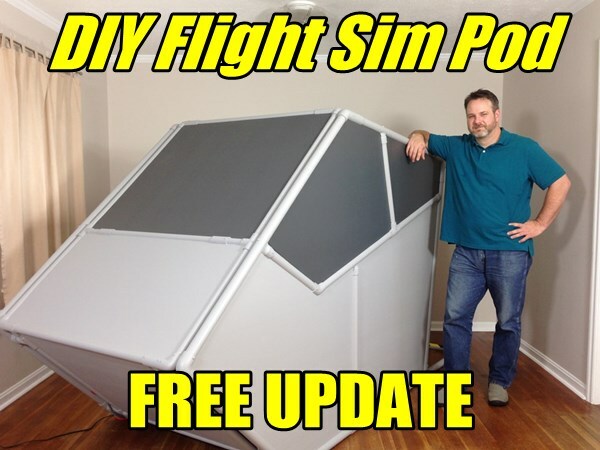 The events were a way to launch the new DIY Flight Sim Pod. But do you really need a reason to drink wine and fly a big airplane simulator? The concept was simple: everybody bring some wine, and then fly the sim over Italian wine country. Brilliant! If you have a sharp eye you noticed that I built the Pod with a removable window. This makes it far easier to take pictures over the pilot’s shoulder. In addition it allows more people to watch and provide helpful commentary. I originally designed the Pod with a closed top canopy. In these pictures, the top is open. The top canopy frame is still there, but I just didn’t install a foam body panel. This allows much more light in the cockpit for videos and pictures. The most noteworthy change was the addition of a second monitor for the flight instruments. This is obvious in the pictures from the second Wine Flights party. The additional monitor freed up the entire 40 inch HDTV to display the outside view and it was glorious. We flew over simulated wine country in Italy. I used upgraded scenery packages from Orbx. Namely FTX Global and FTX Vector. I also installed FSPS Xtreme FSX PC which is a utility that helps FSX fly smoothly with higher frame rates. We used the default FSX Beechcraft Baron. That was pretty much all we needed for a great event. Well, all that plus wine, I mean. Here’s wishing you and yours a very Merry Christmas from Roger Dodger Aviation. I’m lucky for my opportunities to share aviation (both real and simulated) with people. Christmas Lights on a Flight Simulator! Let’s deck the flight sims with boughs of holly, tinsel, and colored lights! I like to decorate my flight simulator for Christmas and it’s one of my favorite holiday traditions. I think I’m the only flight simulator entrepreneur that currently does this. All of my decorating efforts go into the simulator because more people see it than see my house. December is so busy I rarely have people over to visit, however many people see my pictures and videos online. I like to fly some of the old winter missions in FSX like the apple delivery missions or the Alaska missions. 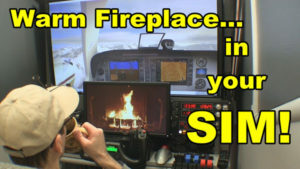 I drink hot chocolate and fly my simulator, it’s a wonderful time. Often I’m bundled up in a hoodie and scarf since I can’t afford to run the furnace at a reasonable temperature. Many of you don’t know this but I am a real pilot with 1200 hours. I used to provide scenic flight in an actual Cessna 172 over Kansas City. Each year, the Plaza decorates all of its buildings with brilliant lights throughout the entire holiday season. I provided night flights to the public from the KC Downtown Wheeler Airport over the Plaza Lights. For many people this was their first experience in a small airplane. 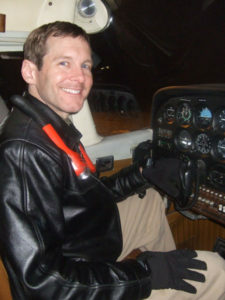 I even awarded certificates and aviator wings after the flights since this was a special occasion. Season after season I provided these flights and it became an important part of Christmas to me and for this city. I did more Plaza Flights than anyone else in the city during the years I offered them. I wish you the best this holiday season. Get ready because January is Build Month! 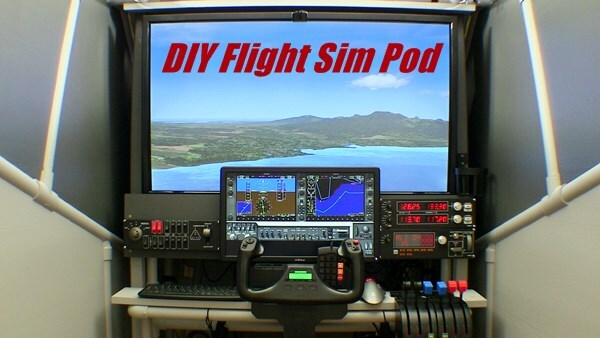 Many customers build DIY Flight Sims projects during January. It’s a great time to do it.